I have a lot of friends that sell jewelry. They’re in that “Owl” business. You know what I’m talking about! They keep telling me that they’re putting out pens at their parties that they have lying around with someone else’s promotional message and contact information. 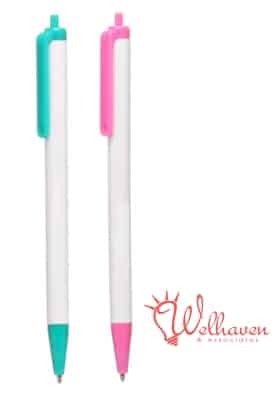 One of my friends emailed me and asked me to find some pens that would be suitable for her business, in colors as close to her business colors as possible. I found it! These teal and pink pens are darling. They come with a white barrel with plenty of room to include the Owl representative contact information. This way, when the pens walk off (and they will) at least they’ll have the Owl representative contact information. People might lose paperwork or business cards but they will surely keep these colorful, pretty pens. The minimum order is 250 pieces at 0.31 each right now. That pricing is guaranteed through 6-30-2014. In addition, there is an order set up fee of $38. Shipping on 250 pieces to the lower-48 states is a flat $25. Sales tax is charged in Florida. Payment is due after proof approval and prior to production. Interested? Just contact me and I’ll put together a proof and quote for you!